The 26 states in which I will run as a write-in candidate for POTUS in 2016 have been identified. Those states were selected based on their ease with which a write-in candidate can run in conjunction with their electoral value. I am not focusing on 24 states due to a combination of either their prohibition of write-in candidates, extensive filing/petition requirements, or filing fees. Remember, the aim of my campaign is simply to demonstrate how anyone meeting the constitutional requirements for the POTUS can reject status quo politics and run for themselves. I also want to demonstrate how this can be done in a manner that precludes federal filing requirements or the raising/spending of campaign finances. In the end I hope it inspires others to run for themselves as candidates. Based on my state-grading scale outlined in a previous post, I can only get to 210 electoral votes with the 1’s and 2’s. That leaves 60 outstanding electoral votes (to get to 270) from some combination of nine states graded as 3’s. States graded as 3 require basic paperwork to be filed (i.e. Declaration of Intent or Affidavit of Candidacy) along with as many elector signatures as each state has electoral votes (i.e. 9 in CO, 18 in OH, etc). 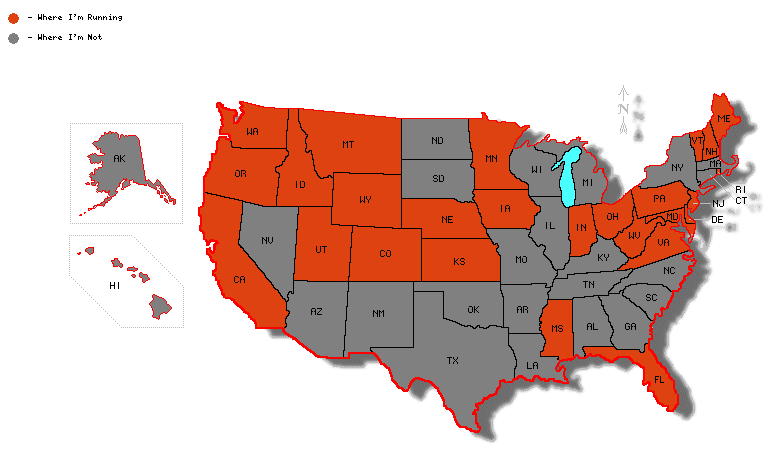 The four ‘3’ states I’m targeting to get to 270 are: Colorado (my home state), Ohio, Florida, and Maine. The reason I’m choosing these four is because they’re the ones where I have the most friends and family…if I can’t earn the support of my friends and family then I likely won’t earn the support of strangers! On that note, my electors in those four states are in no way obligated to vote for me during the general election; they are free to vote for whomever they choose. But if I happen to win their state, then their signature does obligate them to cast their electoral vote for me on behalf of their state’s popular voters. Since the odds of me winning any state are worse than a two-legged horse winning the Kentucky derby, I don’t think this will be a tough ask. Now that my electoral research is complete and my targets drawn, the next phase of my POTUS project is to articulate a campaign platform. This will be done through a series of posts outlining my stance on individual issues, or planks. Rather than position myself on a narrow set of issues, my platform will cover a wide range that will include boilerplate issues like taxation, death penalty, abortion, etc. The guiding theme of my platform will be the individual’s right to life, liberty, and the pursuit of happiness. While that sounds plain Jane, it’s a potent and effective litmus test for every issue no matter how straightforward or complex. In parallel I will be reaching out to my family and friends in CO, OH, FL, and ME to secure their support and signatures as electors. If you live in one of those states expect to hear from me soon! This entry was posted in Politics and tagged Colorado, Florida, Maine, POTUS Project on May 5, 2013 by coreysterner.